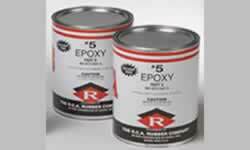 Epoxy - (2 parts per gallon unit; 100 sq. ft.) Used for Stair Nosing, Heavy Duty Target or Outdoor Rubber Stair Treads or any other rubber stair tread or nosing. May be used in areas where moisture exists. Should be installed at room temperature. 50 degrees is the absolute lowest installation temp. Will take a full 48 hours to cure. I have the Rubber Epoxy Adhesive #A402. It was used as an adhesive for carpet to cement floor. Is there a way to remove the adhesive from the floor/carpet (heat/solvent/etc)? Thank you for your time. I only need to transition from kitchen to living room which is about 36". I don't need a gallon of epoxy. Do you have smaller quantities? Can I get this kind of epoxy in a smaller quantity anywhere else? Looking for instructions on how to mix Epoxy Adhesive For Stair Treads, Nosing part a and part b and Corner Guards - #A402 and how do I apply it to the rubber stair nosing that I purchased through your site? I am applying it in doors and it will be sticking to my stairs on top of vinyl peel and stick tiles that cover the wooden stairs. Thank you for your time I appreciate it. We are considering purchasing your non-slip outdoor use treads #A60512. We would be putting them on top of existing concrete stairs. What temperature is required for the adhesive to work properly? Thank you. Hi, I am interested in putting rubber stair treads on outdoor stairs at an apartment building. The stairs have brick like tile pavers which I would say are porous. I bought a couple of rubber stair treads to test with and have not had luck in using the proper adhesive that will bond and permanently attach the rubber stair tread to the tile. We are in Miami, FL where its hot, humid and can rain alot during certain months. Do you think the A402 will work for me? Thanks. I am renting an apartment that has stone tile stairs. We are worried that our 2 year old could fall and hit the corner of the stairs so i am looking at the stair nosing options. If i need to remove them when i vacate the apartment will the adhesive come off or is it permanent? What other options do i have? Thank you. I need a set of 5 outdoor use rubber stair covers. I want to buy the epoxy also but can not find out any limits on cold weather use. The job I am working on is outside in Buffalo NY. How cold can it be to use the epoxy adhesive? A two-part Epoxy Flooring Adhesive for installation of only the Stair Nosing Heavy Duty Target or Outdoor Rubber Stair Treads. I used this epoxy to bond rubber treads onto wooden outdoor stairs that were slippery when wet. Pretty easy to mix and spread. Appears to adhere exceptionally well. Definitely no need for fasteners. This winter will be the proof. Great product, it was the only thing that worked on ou tile stairs. worked great, it has a good working time and adheres to just about any material therefore no need to use fasteners. project you wont be disappointed. I retrofitted an existing (wooden) basement (residential) staircase with heavy rubber treading. I read acrylic adhesives was NOT the way to go. This product worked well, treads were clamped in place after appying adhesive and the result was SOLID. GOOD TO GO! We tried other adhesives before this one to glue rubber stair nosing to a ceramic stair. This is the only one we tried that worked for our lobby staircase. So far, so good. Professional rubber nosing for any surfaces such as tile, wood, or stone, while also providing protection from slips & falls. Two-part chemically setting caulk is recommended for use inside the nose of all rubber and vinyl stair treads.